Now, I honestly had no idea what I was going to do here.. 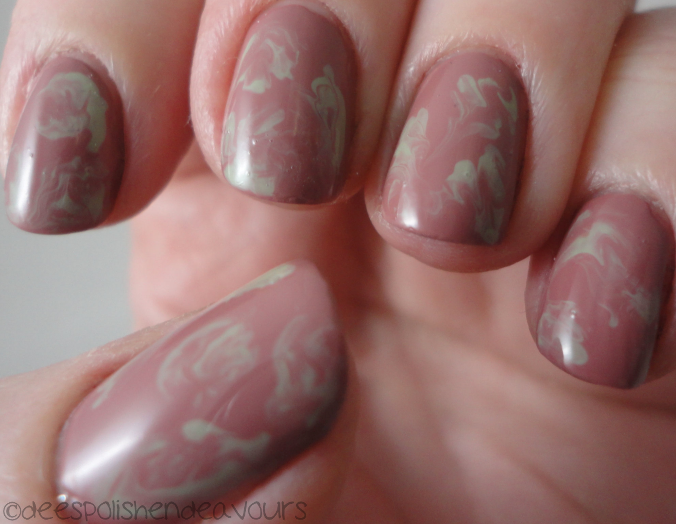 I slapped on some China Glaze Dress Me Up and I had grabbed a bunch of colours and I was going to floral it all up.. But no, that wasn't really what I wanted. So I put on another quick coat of Dress Me Up and dotted on some OPI Stranger Tides.. But dots wasn't what I wanted either.. So I used my dotting tool (from BornPretty) and started to swirl the dots. The results: I actually really like this. It is marble-esque without me failing horribly at water marbling! Yes! It also has a kind of smokey look.. Ok, I really, really like this. See you all for Day 7!! i dont know if i'm feeling dress me up :\ i dont even really like it in the bottle. but i love what you did with this! all my inspiration is going to come from you, lol. really love it - can't believe you managed to get it so wispy - bravo! I really like this look too. So much so, going to try my copy at it. Awesome!!! I love how you did these!